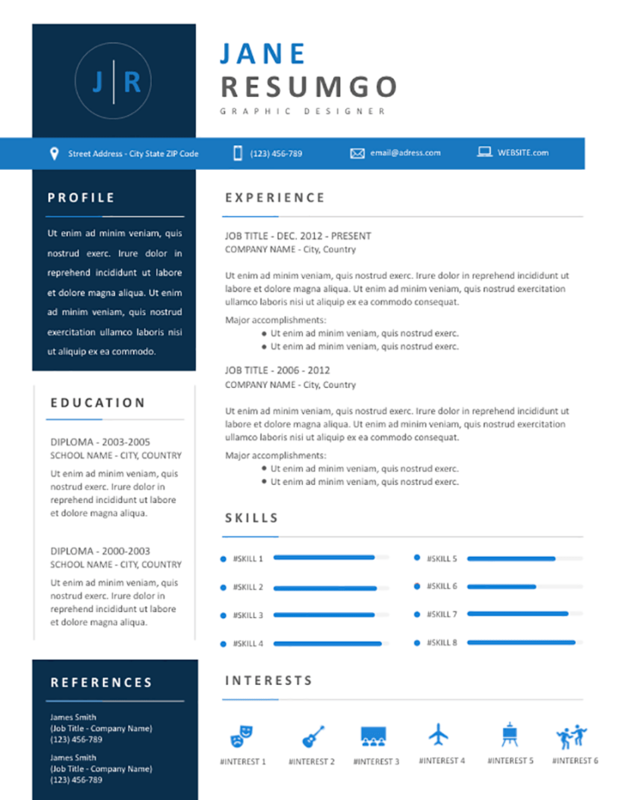 Natasa is a free modern resume template with blue banners and infographic elements. Two-column layout, and very well-balanced structure. This template is perfect to draw attention to your professional experience and skills. These key categories of your CV are positioned in the main right part of this template. Your expertise (skills) are rated via nice blue bar charts. Below, list your interests using icons. A clever horizontal cobalt blue banner where you have your personal contact information separates the header (with your name and job title) from the rest of your content. The left side of the resume (alternatively) features a denim blue and white banner. There go your profile/objective statement, your education, and references (if any).